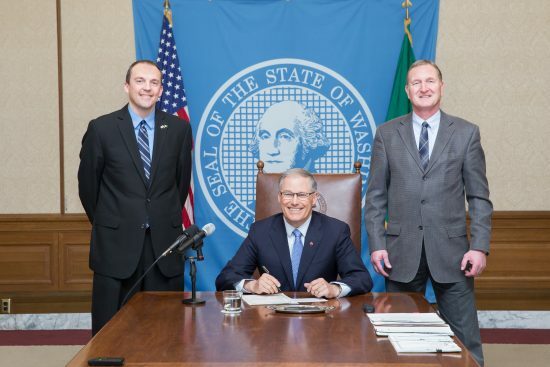 OLYMPIA – Governor Jay Inslee signed the Responsible Representation Act into law today, a bipartisan bill changing the way large counties elect their county commissioners. House Bill 2887, sponsored by Rep. Marcus Riccelli, directs counties with populations over 400,000 to change to a district-based county commission structure beginning in 2022. Spokane County is home to roughly 450,000 residents. With three commissioners, that’s a commissioner-to-citizen ratio of 1-to-150,000. Pierce County, which has 700,000 residents, has a ratio closer to one commissioner for every 100,000 residents. ­­­By comparison, legislative districts, which have roughly 150,000 residents and are represented by one senator and two representatives, have a ratio of roughly 1-to-50,000. Rep. Jeff Holy, who co-sponsored House Bill 2887, says the bill will help the county sidestep potential legal challenges like Montes v. City of Yakima, which questioned the city of Yakima’s election system. Rep. Mike Volz, another co-sponsor of the bill, said the foreseeable passage of the Voting Rights Act spurred lawmakers to propose a solution for Spokane County this session. Rep. Timm Ormsby, a third co-sponsor, said a district-based commissioner system makes sense for the growing and diversifying county. Other Spokane-area representatives who co-sponsored HB 2887 were Matt Shea (R-Spokane Valley) and Bob McCaslin (R-Spokane Valley).